The Yorkshire Arboretum has over 150 volunteers who work alongside the small staff team to care for and develop this lovely place, creating memorable experiences for our visitors. We are indebted to them all for their dedication, skills and enthusiasm. In return, our volunteers get the chance to work in glorious surroundings with like-minded colleagues, to gain new skills to enhance a CV, to meet visitors from around the world and to know they are playing a vital role in helping the arboretum fulfil its potential. The volunteer roles currently available are listed below. If no vacancies are listed, or if none of the ones currently available appeals to you, please bookmark this page and visit often as we post new opportunities regularly. 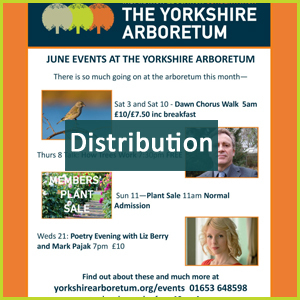 If you have particular skills or experience that you think might be useful to us or are looking for something a little different, such as a day's group volunteering, please contact our Volunteer Coordinator on volunteer@yorkshirearboretum.org, telling us a little about yourself and why you think you could help, or what you would like to do, and include a phone number so we can contact you for a chat.